If all the realtors in the world were like Taylor and the team, the world would be a better place. Taylor is a great negotiator, a nice person and I'm pretty sure a mind reader.Thanks team! Our realtor Christian Bailey was very helpful and informative during the home buying process. This is our first home and he led us in the right direction through the looking, buying, and closing process. He was very attentive to our specific needs and was readily available to answer any questions. 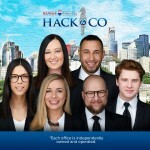 I would definitely recommend Hack & Co for all your reality needs. Excellent realtor - very knowledgeable and responsive to questions. Would definitely recommend for the future. Presented information in a clear way which helped make decisions. Able to analyze our needs and make specific and helpful suggestions. Very easy to work with. Kim was extremely helpful and friendly. She had great knowledge about the market and was always able to answer my questions no matter the time.